I have just over a year left with this goal list. I think it is time to start kicking it into high gear. There are certainly goals on my list that I’m predicting I won’t get completed, but who knows? It’s too early to call it off for a few of them — onward! Hopefully I can get at least one thing on the list completed this month. Be free of credit card debt. I have three full-size tomato plants, a cherry tomato plant and roma tomatoes in my garden this year. 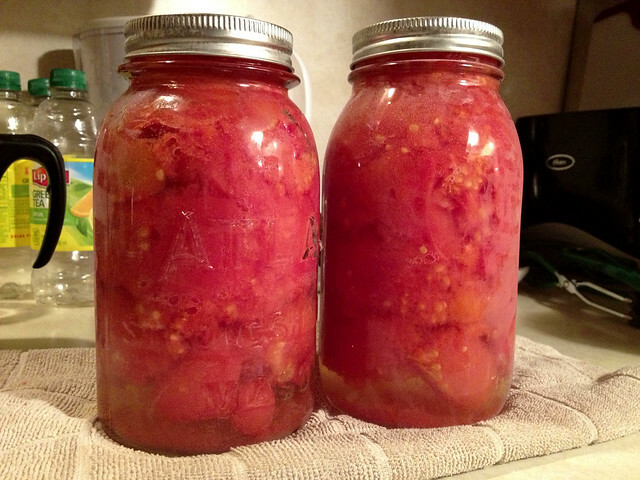 I’ve snacked on quite a few little bitty tomatoes throughout the summer, but I’ve only gotten enough full-size tomatoes at once to can two quarts! That is a little disappointing, but it’s got me already thinking about how I’m going to arrange my garden next summer.